Idyllic, estate sized beachfront property in one of the most desirable locations on Oahu2019;s North Shore. Nearly 1/2 acre in size with 992019; of beach frontage, the property has 3 separate structures on it with easy sandy beach swimming access directly fronting the cottages. Watch the surfers and humpback whales from your deck, or feel the refreshment from a midday dip in the Pacific after relaxing in your hammock under the swaying coconut palm trees. Perfect for a family compound, and just minutes to the amenities and restaurants of Haleiwa town, this rare offering is awaiting your discovery. A few lots east of Papailoa road, where all record sales have occurred on the North Shore, this offering is an exceptional value. Please, send me more information on this property: MLS# 201812409 – $3,185,000 – 61-679 Kamehameha Highway, Haleiwa, HI 96712. 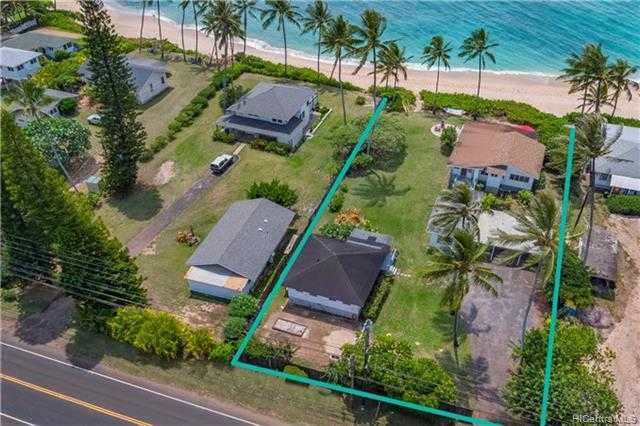 I would like to schedule a showing appointment for this property: MLS# 201812409 – $3,185,000 – 61-679 Kamehameha Highway, Haleiwa, HI 96712.